High school plays are often dull affairs based on classic books, but a school in New Jersey decided to go to the next level. North Bergen High School hosted a play on March 21st and 22nd, 2019, based on the classic 1978 Ridley Scott film. The stage production was made by the members of the North Bergen High School Drama Club in New Jersey. 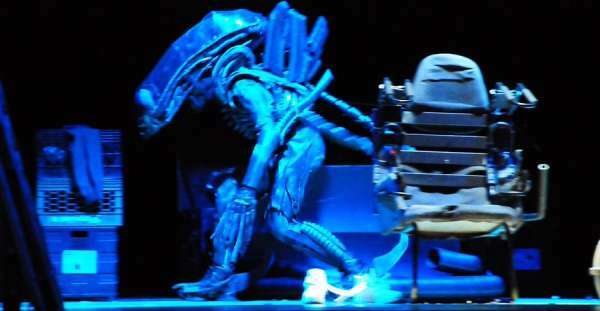 Everything in the production of Alien: The Play was produced using recycled materials. The cast included Ibrahim Jaludi, David De Diego, Pedro Sarmiento, Britney Gonzalez, Jason Lopez, Dakota Rios, and Gabriella Delacruz. The play was adapted and directed by English teacher Perfecto Cuervo. Among those credited with the design is artist Steven Defendini, a North Bergen High School teacher who instructs drawing and digital media. The production is noteworthy for recreating several scenes from the movie including the scene where the chestburster egg attacks Kane. They also recreated the scene where it bursts out of Kane's chest. Defendini said they used so much blood that "it rained on the screen.". Not your typical school play. They also reproduced the final showdown between Ripley and the Alien. Several celebrities showed their support including comedian Patton Oswalt who said "This is fantastic. Blows my high school’s adaptation of PINK FLAMINGOS out of the water." What do you think of the play? Let us know in the comments below!